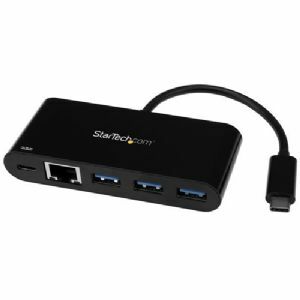 Add powerful connectivity to your USB-C enabled laptop, tablet or desktop computer with this StarTech USB-C to Ethernet Adapter with 3-Port USB 3.0 Hub. Ideal for mobile use, this USB-C to Ethernet adapter plugs into your USB-C or Thunderbolt 3 port to provide wired network access and gives you three USB 3.0 Type-A ports to connect your peripheral devices. Plus you can charge your laptop as you work. In addition, it has Gigabit Ethernet port that supports full Gigabit bandwidth by harnessing the performance of USB 3.0 (5 Gbps), also known as USB 3.1 Gen 1. Buy StarTech USB-C to Ethernet Adapter with 3-Port USB 3.0 Hub now!